As you probably know, my life revolves around my kitties. There are 5 and they bring me so much happiness. I have a special love for cat canvases, so when MaryJane Mitchell approached me to represent her art I said YES! They are folk arty and fun and if you love cats and flowers, they are a happy mix. The last time Julia Snyder was here, I had her write a guide for one of the kitties. I have finally typed it up, added the diagrams and it is ready to roll. Just look at all those fun threads and beads! It’s going to be a knockout when stitched. If you would like to order the canvas and threads, give us a call at 410.296.0405 or click here. If you would like to see more of MaryJane’s canvases, click here. 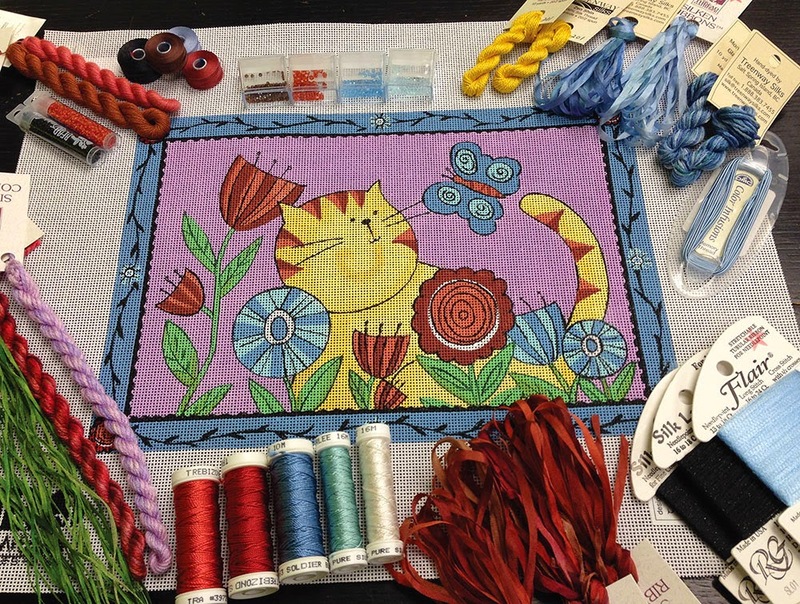 Meredith Willet arrives today for 4 fun days of stitching. I will post pictures as soon as I can. Happy Friday. These canvases are adorable! Thanks for bringing our attention to your new artist!